This is the second event in the Sunbreeze Festival; the first Goldfish Scooping part of the event is also still running. This event is relatively straight-forward once you know how to do it. Head to one of the starting towns, and visit the Moogles in one of the 2 zones they're located in, within each starting city. Buddy up with a friend and talk to the Moogle. When you speak to the Moogle, the Moogle will give you directions to a checkpoint for your partner. The easiest way to do this is for both partners to start the event with the Moogle. One will stay at the Moogle and direct the other to the correct checkpoint. (Do this by speaking with the Moogle, who will give you directions each time for your partner.) The checkpoints are "invisible" - you will need to Tab around to find them. Once you have found the correct checkpoint, you will be given a doll. You can then target the checkpoint and it will give you directions for your partner. Once you have both found the correct checkpoints and received your dolls, you must trade them to each other, and then turn them in to the Moogle. Note: You may only check a few checkpoints, so it's best to be sure of a checkpoint before you select it. Once you get to about 3 "checks" of checkpoints, you will no longer be able to check them, and both you and your partner will need to return to the Moogle to cancel the game, and start over. The Sunbreeze Festival's main event, "Azimuth Circle," will begin on July 28. According to the moogles, Azimuth Circle is to be played in pairs! First off, the game can only be played in pairs--everyone must be in a party of two. So you must begin by searching for a partner. Coupling with a good friend would be ideal, of course. But even if you aren't exactly the most popular master...no problem! Just ask around, kupo! And then, um, ummm...oh yeah! After that, just talk to a moogle with your partner and say you want to start the game, kupo! Then the moogle will tell you where your partner should go. It will also tell your partner where you should go! So you and your partner have to relay information between each other to figure out where to head next, kupo. Each of you should reach your checkpoint with good teamwork! "The name 'Azimuth Circle' comes from this gadget we set on a compass in the old days so we could verify directions proper. I'm not vain enough to name a game after myself! Anyway, I hope you and your partner become good friends while playing. Maybe you can even invite them to join you again later wearing the rewards you gained from playing. I wonder what games you could play with them then...haw haw.........!" At the following time, we will be performing a FINAL FANTASY XI(Windows) version update. This update will not be accompanied by server maintenance. Usual play may continue for FINAL FANTASY XI. Thank you. *The client software will also be updated at this time. The client update will begin once you connect to FINAL FANTASY XI. Please follow the instructions that appear on your screen. - An issue wherein FINAL FANTASY XI would terminate for users of 32MB VRAM (video memory) graphic cards or graphic chipsets will be addressed. * This fix is not intended to make FINAL FANTASY XI compatible with PCs that do not meet the minimum spec. Microsoft only had one live game demonstration at the Tokyo Xbox Summit today. Towards the end of the conference, Square Enix producer Hiromichi Tanaka took the stage, shared the E3 Final Fantasy XI trailer with the audience, then proceeded to play the game right before our eyes. The version of the game played by Tanaka features the most recent Final Fantasy XI world updates and runs on the actually Xbox 360 hardware. If you want a first look at how FFXI will look and play on the 360, download our two gameplay videos in the video section below (Tanaka didn't play too well because he was speaking). In closing, Tanaka assured that Final Fantasy XI's beta test is still on track to kick off with the launch of the 360 later this year. He even went so far as to say that the beta test will occur on a previously unseen scale. Brief gameplay videos of this early version of the X360 FFXI can be seen at IGN as well. Speculation has been running high regarding two new trademarks filed this month by Square-Enix at the United States Patent and Trademark Office. The first was the trademark Treasures of Aht Urhgan, while the second was named Scars of the War. It remains to be seen if these will be used, and if so whether they are related to Final Fantasy XI, but one could possibly be the name of the next expansion. Come armed with your Yukata and some spare gil for scoops, and get ready to scoop, scoop, scoop! This is the first section of the Sunbreeze Festival event. Head to the area of your choice and talk to the NPC. There, you will receive a free Goldfish Bowl (last option when you talk to them), and have the opportunity to purchase super scoops at 100 gil apiece (they stack to 12). Equip the Goldfish Bowl (range) and the Super Scoop (ammo), then go wading into the water. This pretty much works just like fishing. You even type /fish (or fish from your menu) to "scoop". However, the wait time in between scooping is much shorter (and the animation more amusing). A tiny goldfish has approached! A plump, black goldfish has approached! A fat, juicy goldfish has approached! The paper on your super scoop ripped. After you've acquired some goldfish, bring them back to the NPC and trade them. They will count up your fishies, and award you the allotted points. Event Item Rewards: Spirit Masque, Goldfish Set, Super Scoop, Black Drop, Blue Drop, Clear Drop, Green Drop, Purple Drop, Red Drop, White Drop, Goldfish Set. Other Items Used in Event: Goldfish Bowl, Tiny Goldfish, Black Bubble-Eye, Lionhead, Lord's Yukata, Lady's Yukata. Everything in this site update is from the July 19 patch. 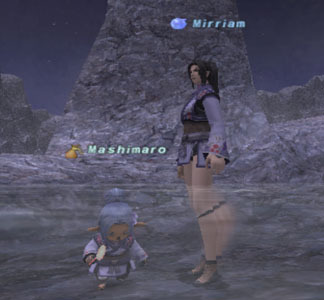 The specifics of all the changes and additions can be found in the July 2005 FFXI Patch Compilation of Info, which is being constantly updated with the lastest info from the patch. Since the implementation of the latest version update on Jul. 18, 2005, the following quest related issue has been discovered. Maintenance to address this issue was performed on Jul. 25, 2005 at 2:00 (PDT). -After making a request to the "An Affable Adamantking?" NPC for a new quest item, and then speaking to the "A Moral Manifest?" NPC, players will obtain an incorrect item and will no longer be able to receive the correct item from the original NPC. This issue also occurs when making a new item request to the "A Moral Manifest?" NPC, then speaking to the "An Affable Adamantking?" NPC. * For players who have obtained the incorrect item and have yet to complete the quest, the correct item may be obtained by trading the incorrect item to the original quest NPC. Since the implementation of the latest version update on Jul. 18, 2005, several gameplay and system related issues have been discovered. Solutions to these issues are now being tested. Players will be informed as soon as solutions are finalized. - An issue in official Ballista matches where auto-balance entries would result in unbalanced forces. - An issue wherein mannequins do not pose as they are intended. - An item, "a spool of wool thread" that is necessary for synthesizing "Yagudo Headgear" has been found missing in the NPC dialogues. Enjoy the Season with the Sunbreeze Festival! Every year at about this time, a seasonal festival is held in Vana'diel where the wild and even the wacky are regular occurrences! This year, the festivities have a new name--the "Sunbreeze Festival." So what will we be celebrating this time? And what does the festival hold for curious adventurers? My wings are wilting wretchedly in this warm weather, kupo! Of course, we moogles aren't the only ones suffering, kupo! All the craftsmen, merchants, and even the city guards are languishing listlessly while longing for a little relief from the heat. Officials from each nation have joined forces with the M.H.M.U. to lift the spirits of sweltering soldiers and adventurers alike with a brand-new proposal: the Sunbreeze Festival! Fantastic fireworks and sensational goldfish scooping are slated to make a return this year, along with the introduction of the Rakapopo Dancers; a Tarutaru troupe that performs the Far Eastern Sunbreeze Shuffle! And don't miss out on the wonderful prizes to be won from the addictive new game invented by Azimuth of the Alchemists' Guild, kupo! All these absorbing activities are sure to take your mind off the heat, so join your friends and help make the Sunbreeze Festival a refreshing success! This event is scheduled to commence at Jul. 21, 2005 17:00 (PST). The festival will take place in the following areas, with festive music and fireworks to liven up the evening from 19:00 to 6:00 (Vana'diel Time). *We confirmed that the previous information about where the fireworks will be sold were incorrect. However, the information have been corrected. We apologize for the inconvenience this may have caused. Latest Additions: Updated with the latest information; as more info is available regarding the additions in this patch, it will be added. The main info still missing here relates to Sea, and the many drops from the mobs there; once that data is completed in the database, this Compilation of Info will be updated to reflect that info. This is an update regarding the version update error occuring since Jul. 19, 2005 2:00 (PDT). Due to heavy server traffic, some of the users are still experiencing difficulties logging into PlayOnline contents. We will continue to investigate and conduct every operation necessary to resolve this matter. If timeout or network error occurs, we ask that you please wait awhile and then try again. Due to heavy server traffic upon the completion of maintenance at 2:00 (PDT), timeout or network errors may occur when you try to log into PlayOnline contents. Access to PlayOnline.com (http://www.playonline.com/) may also be affected. If you are unable to access the version update, we ask that you please wait a while and then try again.